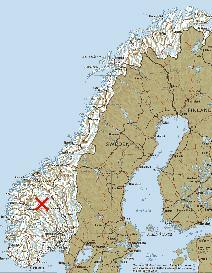 My trip started with a four hour train journey North from Oslo to Otta, followed by a couple of hours on a coach to Gjendesheim. This journey passed through some fantastic scenery, particularly the last part of the coach trip, and enthused me about what was to come. 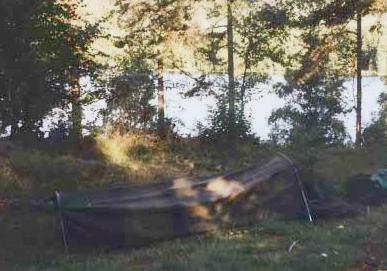 Once I got to Gjendesheim I quickly left the tourists at the car park and tourist kiosk and walked about 3km in the late afternoon sunshine up to Bessvatnet where I made camp at the water's edge. Total for the day:3km, 300m. It was still rather cloudy but not actually raining so I decided to risk an ascent of the large lump at the other end of the lake - Besshø, 2258m. 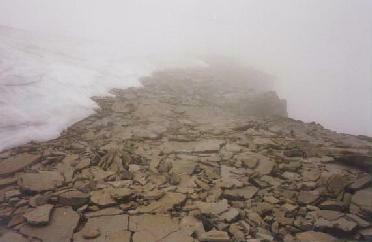 The climb was straightforward enough, but visibility dropped to next-to-nothing once I got up to the summit ridge. This seemed fairly airy from what I could see - to the right there was an enormous drop to Russdalen - over 1000m below - and to the left was Besshøbreen (glacier). My path between these two obstacles was in places only a few metres wide! 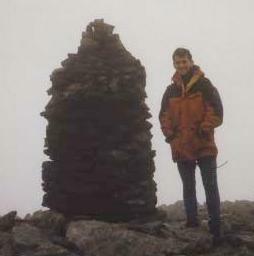 The summit was marked by a well-built cairn but no view. No view from the top of Besshø. 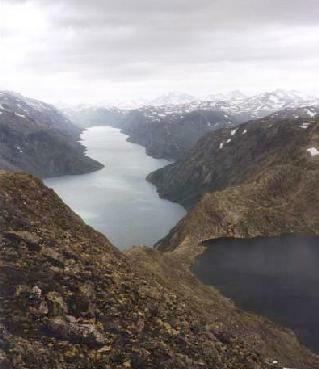 Gjende (left) and Bessvatnet (right) separated by the narrow Bandet. 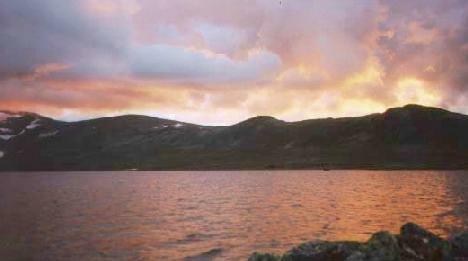 I completed the day by returning over Veslefjellet (1743m). 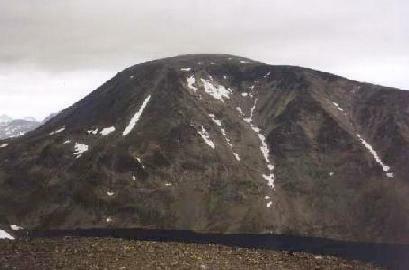 By this time the weather had improved and I could see Besshø - rather a lump from this side. 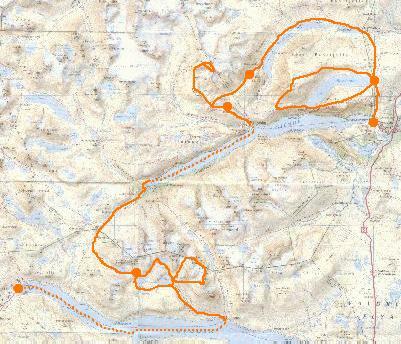 Total for the day:19km, 1300m. After the fantastic day on Surtningssua I decided to take a day off and soak up the sun at my idyllic camping spot by Hesltjørna. I had also had some knee pain on the way down so that gave another excuse for taking a day off. This was a holiday, not an expedition! 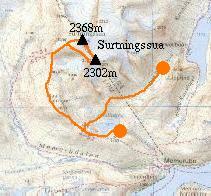 My plan for the day was to climb some of the nearby peaks, many of which had looked interesting from the other side of Gjende. I spent all morning wandering around finding that most obvious ascent routes were made awkward by patches of snow, but eventually I found a snow free route up to Torfinns egga (~2020m). 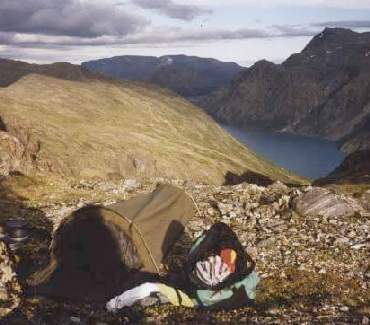 From here I had an excellent view of some climbers attempting a traverse of the precipitous Torfinns tindane - something to try on a future visit! 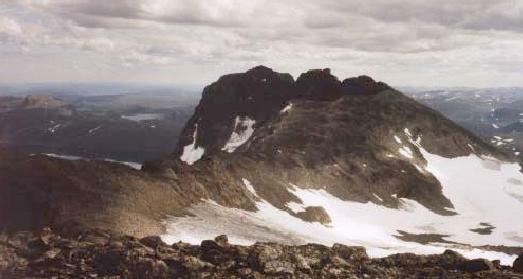 I then went North and reached the summit of Kvitskartind (2193m), from where there were excellent views of the local peaks, dominated by Mesmogtind, and the higher peaks to the East. 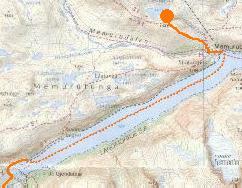 I finished the day with a short glacier crossing after descending Kvitskartind's North West ridge. store Knutsholstind from Torfins egga. 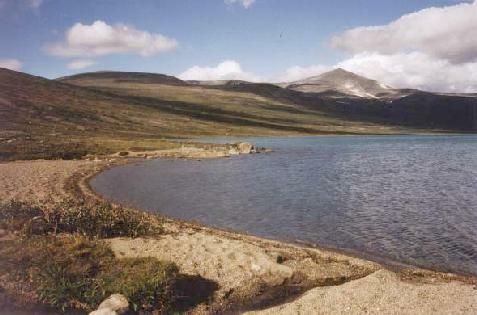 Torfins egga and Torfins tindane from below Kvitskartind. 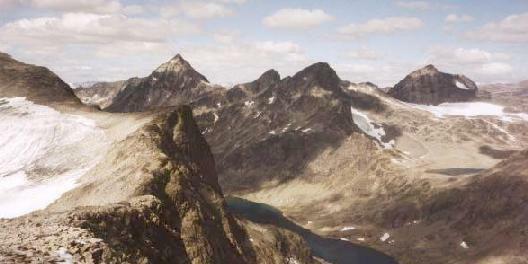 Langedals tind, Mesmogtind and store Knutsholstind from Kvitskartind. Total for the day:18km, 1030m. 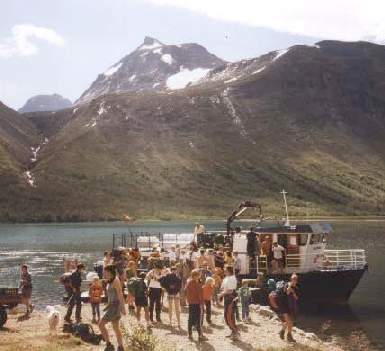 With some sadness I descended to Torfinsbu and took the boat - which claims to be Northern Europe's highest scheduled boat service - to Eidsbugarden at the other end of Bygdin. 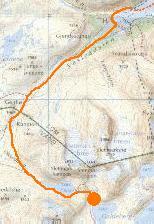 From there I caught a bus back to civilisation in the form of the main road at Tyinkrysset. This bus journey was one of the most memorable parts of the trip - as we drove along the unpaved road alongside Tyin lake there were the most fantastic views of the receding Jotunheim mountains reflected in the calm water. This definitely made me want to return. 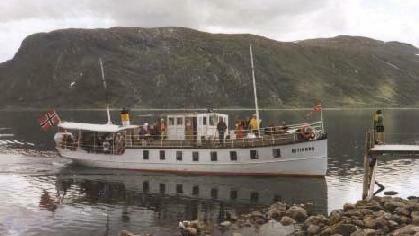 Northern Europe's highest boat on Bygdin, 1057m. 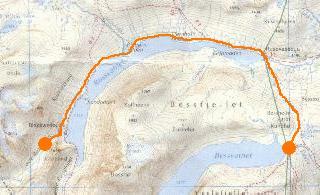 Over 9 days I had walked 99km and climbed 4680m. Total for the day:9km, 0m.